​A travel agent really has to provide information above and beyond what can be found online. This is why I only sell certain products/destinations to make sure my personal experiences and expertise are doing just that. Hello! My name is Dominique Barba. I'm the owner of Bliss Travel Service. I live in sunny Chandler, Arizona with my two beautiful children and my two chihuahuas. I love working with people to help make their vacations even better than they could imagine. You don't know what you are missing until you give it a try. I would love the opportunity to show you the benefits. I like making things easy for people and surprising my clients with fun amenities they could not get on their own. The most important part of my job is getting you the best value for the price range you have to spend. Vienna was a city that really surprised me. It was such a wonderful mix of history, culture, and modern amenities. I love the horse stables in the middle of the city and the clip clop of the hooves as they move through the streets. The art museum was actually built to be an art museum and is a masterpiece in itself. And who can forget the music? I'm counting down the days to my next Danube river cruise to visit Vienna again. 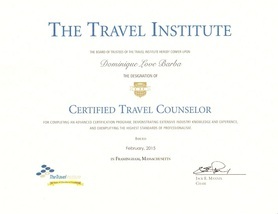 Dominique has been designated a Certified Travel Counselor (CTC) from The Travel Institute. 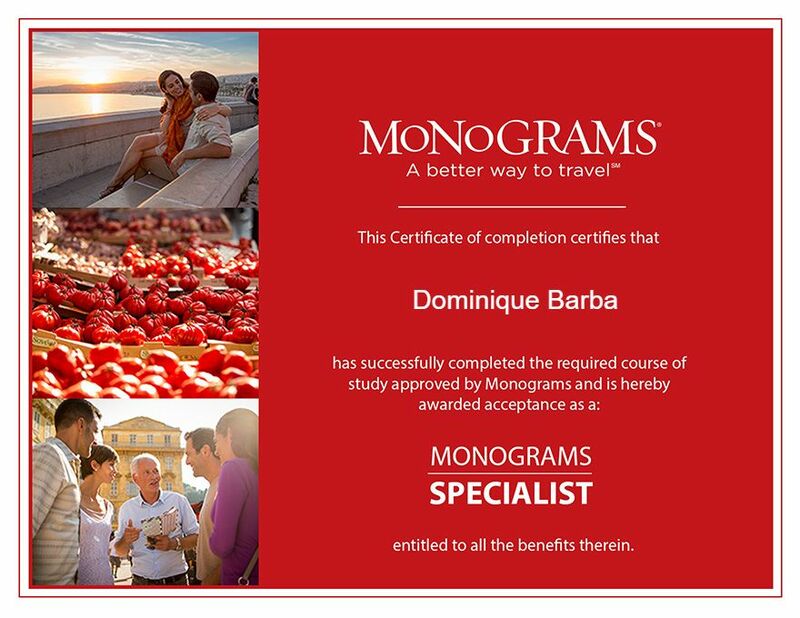 The Certified Travel Counselor designation is conferred by the Travel Institute upon travel professionals who complete an advanced certification program, demonstrate extensive industry knowledge and experience, and exemplify the highest standards of professionalism. Dominique is an Elite Cruise Counselor (ECC) from CLIA. 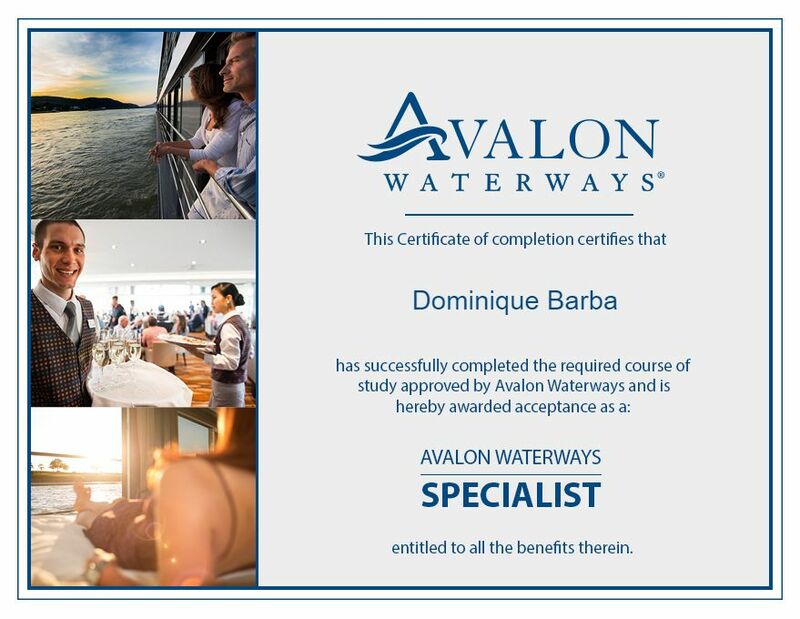 This is achieved through completion of a comprehensive program of cruise sales, training, and product instruction, delivered through a combination of extensive classroom training and personal cruise experience. CLIA's Certificate program graduates are widely recognized as the foremost cruise vacation experts among American travel agents. 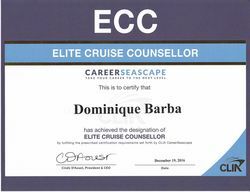 To achieve ECC level, 310 credits of training must be completed, 13 different ship inspections, 115+ cruise cabins sold, and 5 sailings on 5 different cruise lines. Dominique's actual sailing experience is over 20 cruises on 10 different cruise lines. 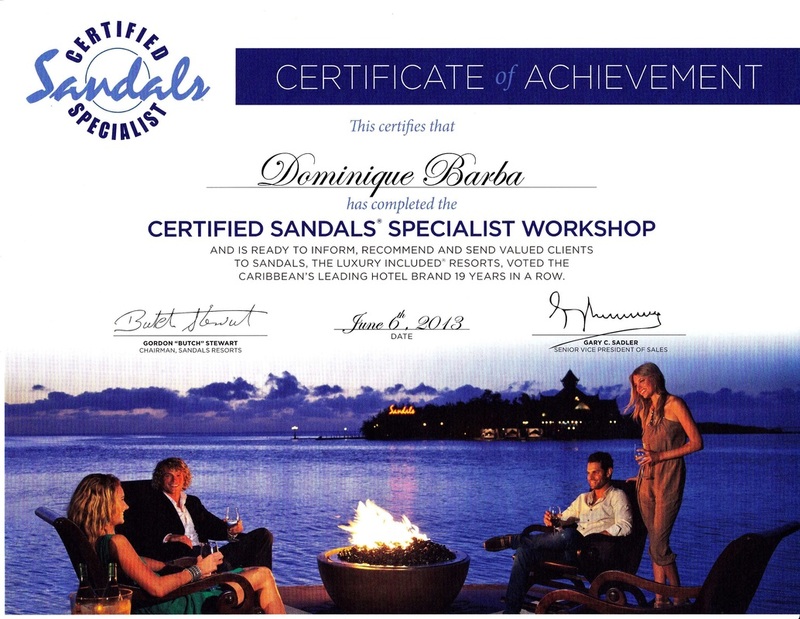 Dominique is a preferred travel agency for Sandals/Beaches Resorts and a Gourmet Inclusive Vacation Consultant (GIVC) for Karisma Resorts. 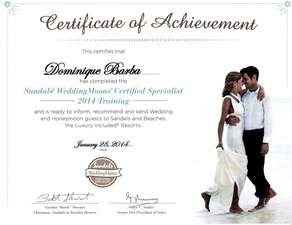 She has also received specialized training in Destination Weddings, Royal Caribbean Cruise Lines, Carnival Cruise Lines, Princess Cruise Lines, NCL cruise lines, Palace Resorts, AMResorts, and many others.